I bring this image, clip and article to you of the sociable weavers, so that we may become a more perfect society. 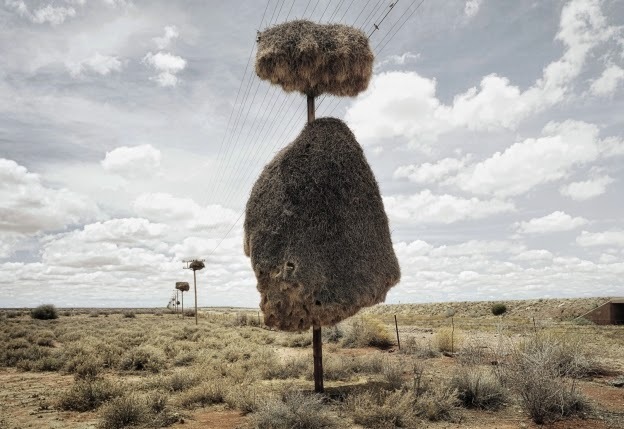 If you don't feel like joining the crowd, you may instead be inspired by the accretive force and sculptural beauty of these birds' nests. A clip of David Attenborough and sociable weavers. A short article by the inimitable Bernd Heinrich, from Audubon Magazine. I am working on my waltz these days. It is also instrumental in forming a more perfect society. I hope you will take the opportunity to learn to waltz. If we keep at it, and we get reasonably good at it, we can take our feet out to a grand ballroom, like the Blackpool Tower. We might even see the Wurlitzer descend, during the organ changeover. Until we meet on the ballroom, or out on the veldt.